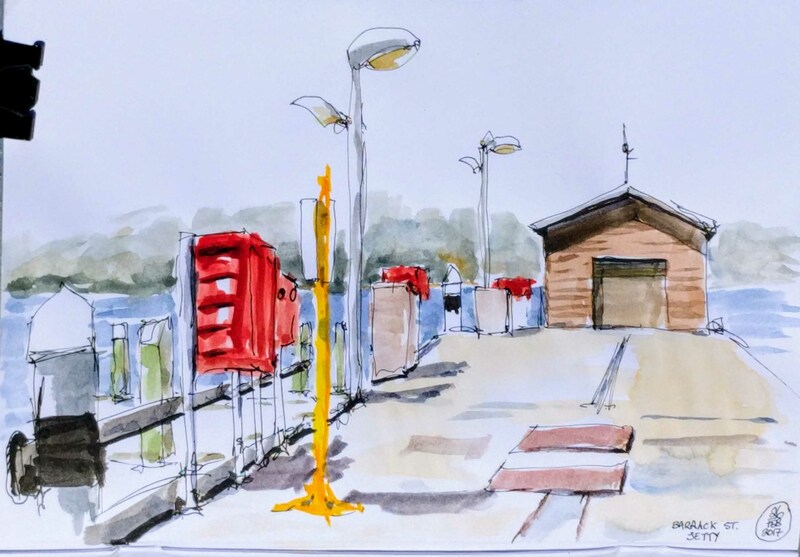 Barrack Street Jetty in Perth this morning with the Urban Sketchers Perth (10 of us). 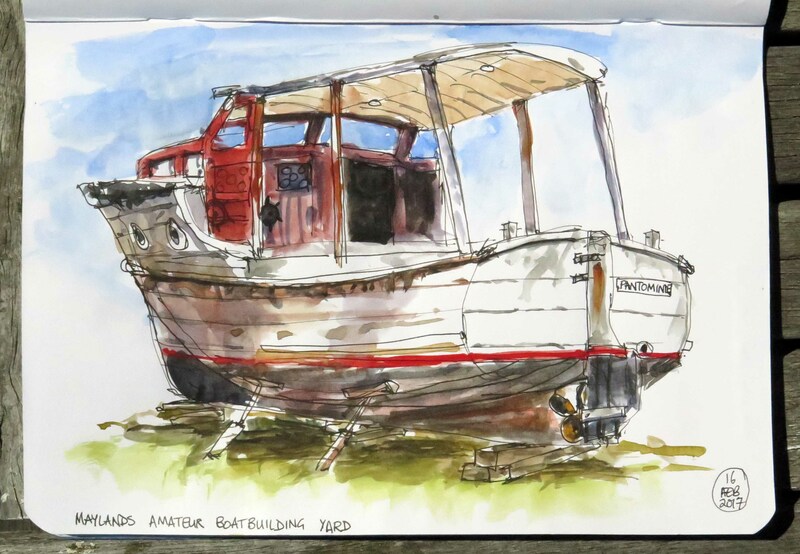 A lovely morning sketching around the bustling jetties…. ferries across the river to Mends Street, down the river to Freo and onwards to Rottnest Island, plus river cruises up and down the river all depart from here. 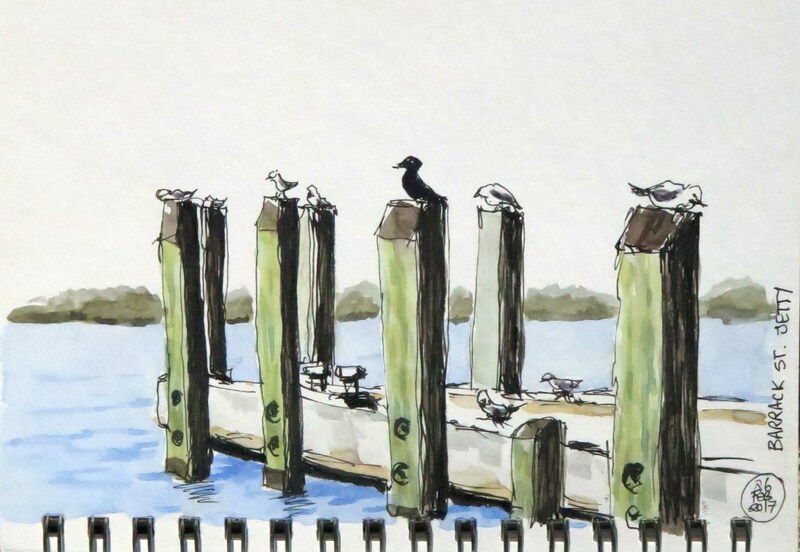 Below….found a lovely quiet and shady spot around the back of one of the cafes to sketch these posts – each post had a resident bird, mostly seagulls and one cormorant (locally known as “shags”) , the water was very calm and glassy. 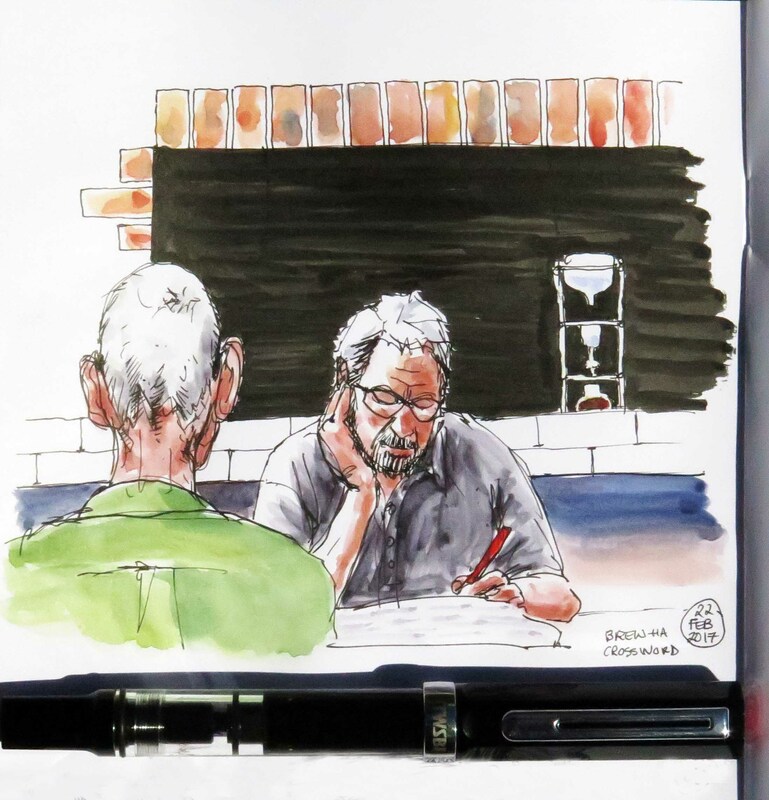 Sketching from the ABC News website….experimemting with a new brush….Holcroft #2 synthetic quill…. a lovely brush – holds lots of paint/water with a good point. Much cheaper and more humane than a sable brush. 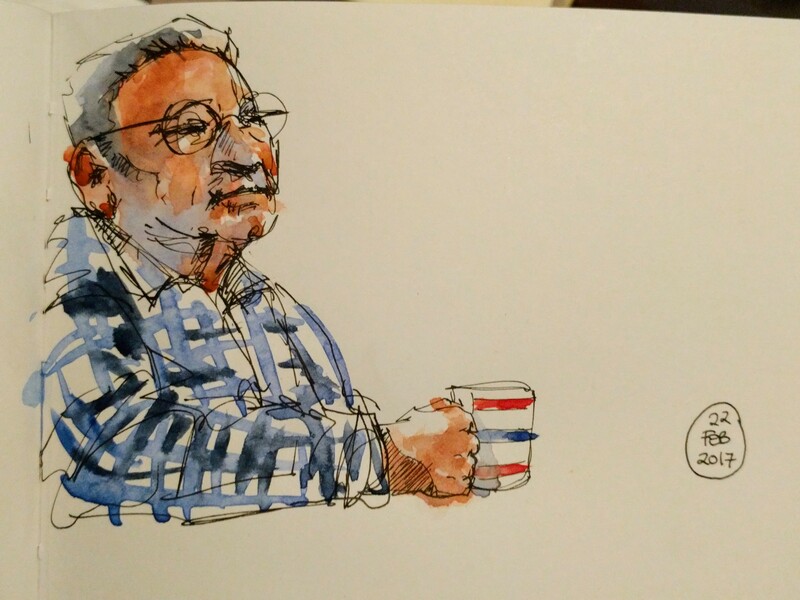 At my usual coffee shop again…. love it when someone gets stuck on the crossword….they can sit still for quite a while trying to work out the missing word! Maylands Amateur Boat Builders Yard this morning, on the banks of the Swan river in Maylands. This is a boat yard full of boats in various states of repair/disrepair….their owners working on them as time and money allow. Some boats look like they have been awaiting attention on dry land for a very long time. Above a wooden motor boat named “Pantomime” in need of some TLC. 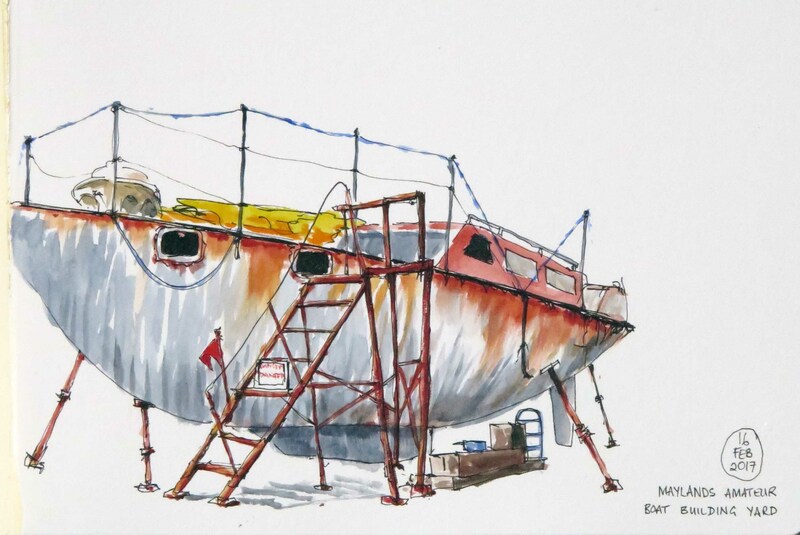 On the right an un-named metal yacht with lovely rust stains dribbling down her hull. Access via a wonderful homemade set of rusty steel ladders made of various lengths of steel welded together. There was a “danger – no access” sign on the ladders….apparently her owner has not about much lately. 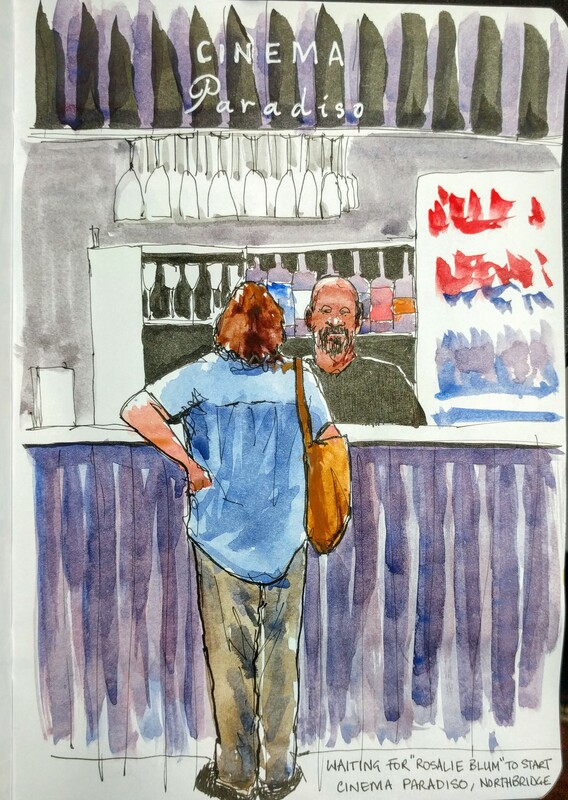 Waiting for French film “Rosalie Blum” to start this afternoon at Cinema Paradiso in Northbridge. Cinema Paradiso is a lovely small cinema which shows mainly art house and non-mainstream films….Such a refreshing change from some of the recycled Hollywood crap that’s currently out there. Great film, story, actors and subtitles (my French is pretty rusty). Nice to step into another world for a couple of hours. 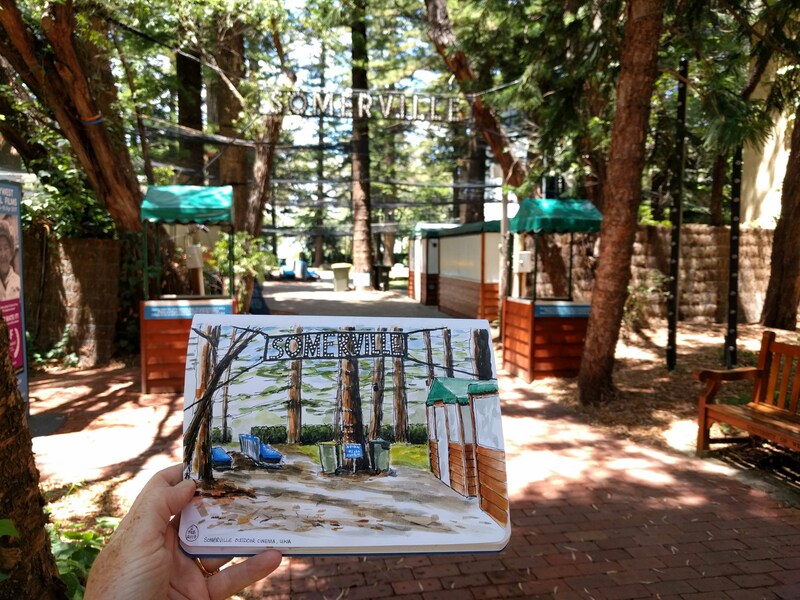 Spent a pleasant morning out painting with the Plein Air Painters Perth at the lovely Somerville Auditorium. This is a gorgeous outdoor theatre set in the University of Western Australia (UWA) grounds. This area of the university is also known as the “cathedral of pines” because of the huge Norfolk pine trees that were planted by William Somerville to create an open air venue sometime after 1927. 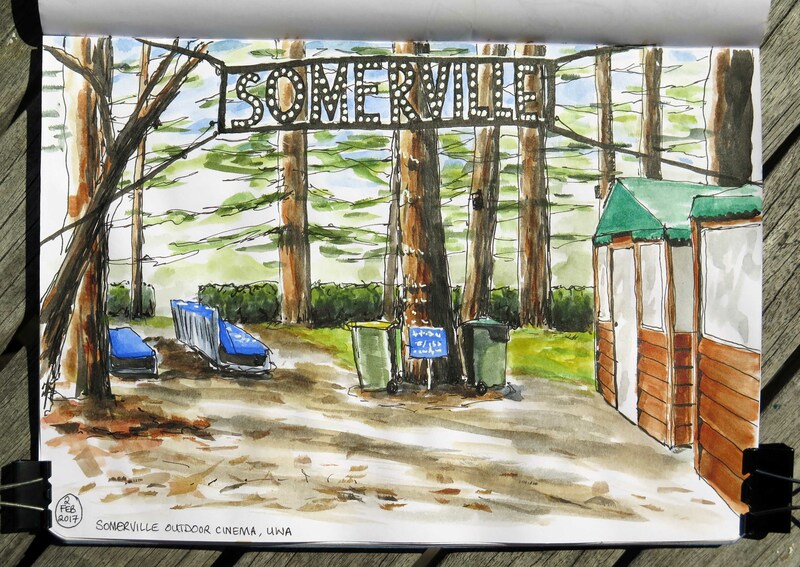 The Somerville is home to Perth’s International Film Festival with nightly showings after sunset in the summer months, the public gather to eat picnics on the grass surrounded by the massive trees before settling down in deckchairs at sunset to watch the film. 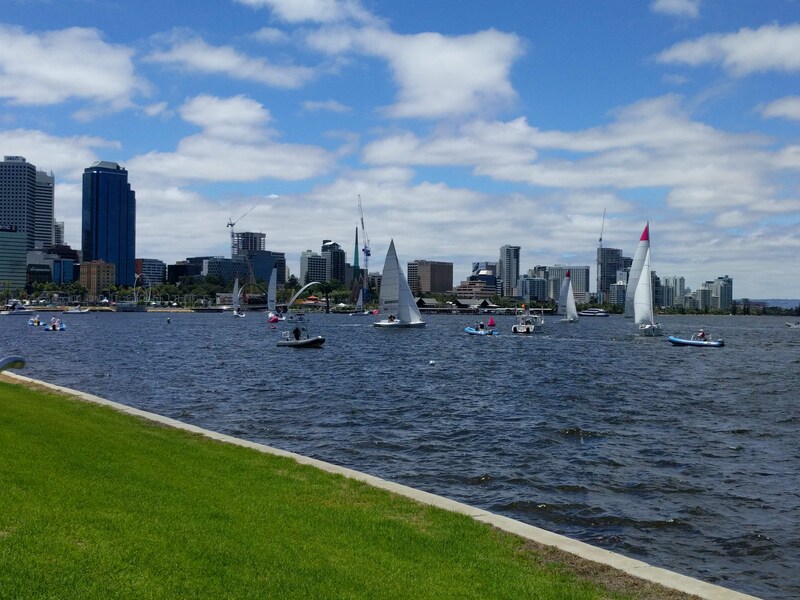 On my bike ride into the city there was a yacht race on the Swan river just outside of Elizabeth Quay….the city makes a great back-drop for the race.